Growing older brings on new sets of health concerns and changing nutritional needs. For a man older than 50, taking a multivitamin made specifically for senior men can help you meet your daily nutritional needs. Knowing which nutrients have increased in importance as you've aged can help you find the best multivitamin for you. Also, consult with your doctor for suggestions on the best supplements before making a final decision. The American Dietetic Association (ADA) advises that older men need to take steps to ensure they consume enough of certain nutrients to make up for common shortages. You can use the Institute of Medicine's Dietary Reference Intakes chart (see Resources) to help you find the right amount of vitamins and minerals to consume each day for your age. Senior men often need to supplement a healthy eating plan with calcium, vitamin D, fiber and potassium, the ADA recommends. Vitamin D helps the body absorb calcium, which prevents brittle bones and osteoporosis. Fiber is good for your heart and also helps you maintain healthy bowel movements. Potassium can help prevent high blood pressure, a common condition among older men. Independent consumer research groups ConsumerReports.org and ConsumerLab.com both recommend Centrum Silver for adults older than age 50 to meet the recommended daily intake amounts of nutrients for seniors, according to ConsumerSearch.com. Centrum Silver includes calcium, B vitamins, vitamin D and a small amount of potassium. Centrum Silver also contains antioxidants, which can help protect your body from damaging elements in the environment, such as smoke, sun and pollution. Centrum Silver does not contain fiber, so your doctor may recommend an additional supplement to ensure you get enough fiber each day. ConsumerReports.org and ConsumerLab.com also recommend Kirkland Signature Mature Adults 50+ Multi for seniors to supplement their diets. The Kirkland multivitamins are cheaper than most name-brand vitamins. Kirkland's senior vitamins include vitamin B12, vitamin A, calcium and vitamin D. The supplements also contain a small amount of potassium. As with Centrum's vitamins, Kirkland's do not offer fiber, so your doctor may advise adding an additional supplement to your diet for fiber. 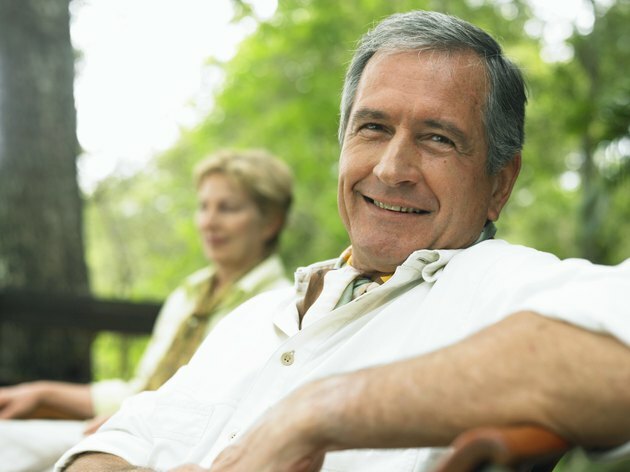 ConsumerSearch.com also recommends One-A-Day Men's 50+ Advantage supplements to help older men meet their daily nutrition requirements. The senior men's formula is one of the few supplements that meets or exceeds the recommended intake for vitamin D. One-A-Day Men's 50+ Advantage also includes vitamins K and B12, as well as calcium and selenium. Selenium is considered an antioxidant, which may help fight the effects of aging. One-A-Day Men's 50+ Advantage vitamins do not contain potassium or fiber. Can Men Use Women's Vitamins?